NEW range of sample storage tubes from Micronic have their alphanumeric codes permanently etched by laser for long-term legibility. Available in 0.5ml, 0.75ml, 1.1ml, and 1.4ml volumes, the tubes are manufactured from a single component and have a flat polypropylene bottom which carries the alphanumeric code. Laser etching means the codes cannot fade or peel off even when subjected to repeated handling, exposure to different solvents, or multiple freeze-thaw cycles. 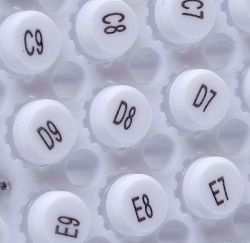 This means that these tubes offer unmatched sample traceability and security, says Micronic. Alphanumeric tubes are sometimes considered the poor cousin of 2D coded tubes, with their lower price making them popular for many organisations. Most competing alphanumerically-coded tubes have a rounded bottom, which is less desirable for laboratory automation applications and can make manual reading more difficult. Micronic says its tubes exhibit absolute product consistency, near zero contaminants, and compliance with US and European Pharmacopoeia tests. They are manufactured from polypropylene in a fully automated class 7 cleanroom, and resist many organic solvents (DMSO, methanol, dichloromethane), may be autoclaved clean and can be repeatedly freeze-thawed without loss of product performance.